To hear chemistry professor Ernie Nolen talk about it, understanding chemistry is the easiest thing in the world, once you enter the right frame of mind. In his three decades at Colgate, Nolen, who holds the Gordon and Dorothy Kline Chair in chemistry and currently directs the Division of Natural Sciences and Mathematics, has seen the department modernize as he has passed his seemingly innate understanding of the microscopic world of atoms and molecules to several generations of students. Most recently, Nolen helped the department earn a National Science Foundation (NSF) grant to modernize its nuclear magnetic resonance (NMR) spectrometer. This is the second time in Nolen’s tenure at Colgate that he has been able to secure funding to update the machine — the new acquisition replaces an NMR Nolen purchased with a grant he received 28 years ago, when he was a visiting professor. “Because I got that, they had to keep me on faculty,” he said with a laugh. The NMR spectrometer is vital to Nolen’s work — the design and synthesis of molecules for biomedical applications — because it gives him a clear view of a molecule, the atoms that make it up, and the relationships between those atoms. This is what really interests him: designing, manipulating, and building on the smallest possible scale. He talks about atoms and their various configurations and interactions with the precision and expertise of a machinist, pointing out that a certain molecule needs a hydrogen atom positioned and oriented just so. Formulate a pharmaceutical with that hydrogen atom pointing in the wrong direction, and it might poison patients rather than cure them. Looking back, he thinks his brain has always been wired for chemistry — even if he didn’t know it. He remembers being a kid in his parent’s bathroom, peering into the medicine cabinet to read the labels. Nolen might have been science-minded, but chemistry didn’t come easily. On the contrary, he went through a frustrating period as a student when he seemingly couldn’t make sense of the subject. As a sophomore at the University of North Carolina, he was battling his way through organic chemistry, a course he now teaches, when the understanding clicked for him. He was building a model carbohydrate molecule one Saturday morning when he took a step back and suddenly recognized the what he had made. He tells this story of his “Saturday morning moment” to all of his organic chemistry students, trying to show them that understanding doesn’t necessarily come naturally for anyone, even those who seem to be hard-wired for a specific subject. 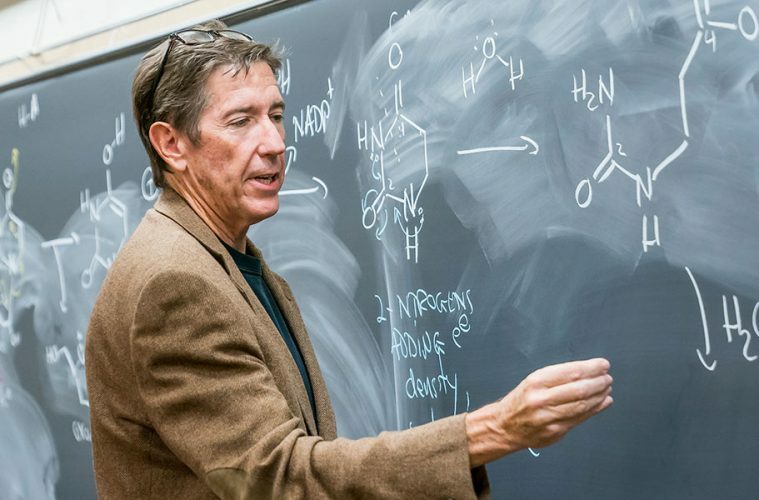 He recognizes now that organic chemistry demands a different mode of thinking and understanding to lower-level chemistry, and he relishes helping students bridge that gap. Learn more about the Colgate chemistry department.